Farming has been, and continues to be, an integral part of the Georgia experience. The Digital Library of Georgia’s collections represent centuries of life on farms around the state through photographs, diaries, correspondence, newspapers, and even moving images. Some of the more endearing collection photographs involve interactions between children and farm animals. 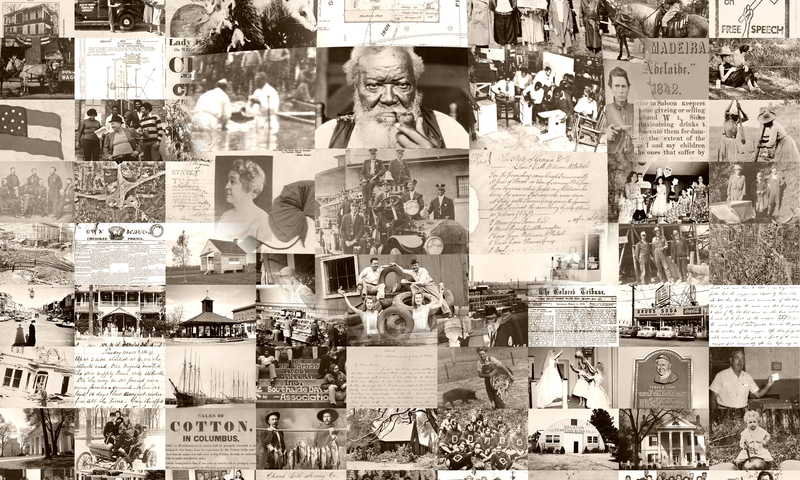 Below is but a small sampling of what you might find amidst our wealth of digital media. 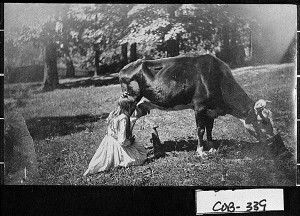 Photograph of a girl milking a cow for a cat in Cobb County, Georgia, circa 1915. The image is from the Vanishing Georgia Collection, a collaboration between the Digital Library of Georgia and the Georgia Archives. 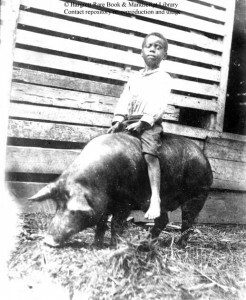 Photograph of a child sitting on the back of a hog in or near Richmond County, Georgia, in the late 19th century. The image is part of the Robert E. Williams Photographic Collection: African Americans in the Augusta, Ga. Vicinity, circa 1872-1898. The site is a joint effort between the Digital Library of Georgia and the Hargrett Rare Book and Manuscript Library. 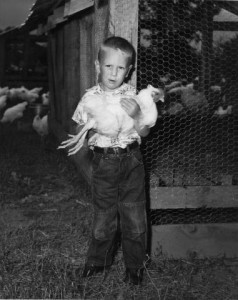 Photograph of young Russell McCants holding a chicken at the Georgia State Fair in Macon, Georgia, in October of 1955 (by anthony at dress-head ). The image can be found at the Georgia State Fair, Macon, 1886-1960 website, a collaboration between the Digital Library of Georgia and the Middle Georgia Archives.